ACT Today! (Autism Care and Treatment Today! ), is a national non-profit organization whose mission is to raise awareness and provide treatment services to families that cannot afford the treatments and services their children require. Recognizing the extraordinary challenges military families experience (waging a battle on two fronts...one for their country and another for their children), ACT Today! for Military Families is a dedicated fund to assist military families impacted by autism. ACT Today! for Military Families works to improve awareness and delivery of effective autism services, and provides financial assistance to military families to help defray out-of-pocket costs associated with autism treatments and other quality of life programs. Free Cakes for Kids is based on the belief that every child deserves a special birthday cake! "When families are severely stressed financially, sometimes it is a choice between a birthday gift or birthday cake." Free Cakes for Kids makes sure families never have to make that choice! Gorgo's Boxes is a paw-it-forward project that began with the kindness of a caregiver within the Warfighter Community. Gorgo's Boxes is simply a tool to connect Warfighter families in need. 7. Take a photo (make sure the shipping address doesn't show!) and we will post it! 9. The RECEIVING family posts/PM's a note of thanks and maybe even photos that can be shared publicly or privately to the anonymous sender. Our Heroes Journey offers clothing and baby item "give-aways" to children on military bases on a regular basis. OHJ works in collaboration with a "Spin Again" a childrens' clothing store and consignment to make these give aways possible! This helps elevate the financial stresses a bit with providing some much needed basic's for these well deserving military kids and their families! Sometimes life throws a curve ball and creates a need that may not fit perfectly within any other Special Ops. That's when Operation Full Support kicks in. Operation Once in a Lifetime was created with the belief that we will never tell a soldier "no." With your help, Operation Full Support assists with rent, utilities, food, clothing, dental care and more. 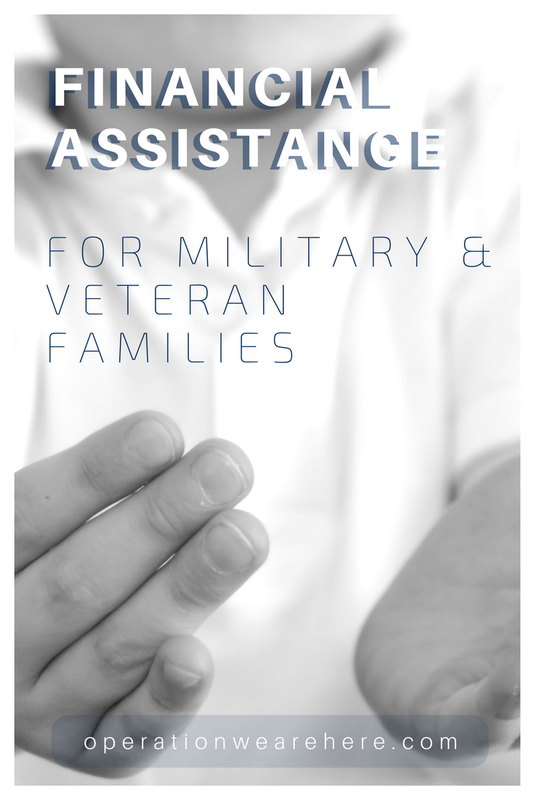 9-1-1 Veterans is a small non-profit organization dedicated to assisting Long Island's veterans. We provide emergency financial assistance to those who have served in - or are still serving in - the finest military in the world. Temporary Emergency Assistance Program - This program focuses on junior enlisted families (Sergeant E-5 and below with children) for short term emergency financial support with food and gas gift cards to respond to short term emergency situations. Army Emergency Relief is a private nonprofit organization incorporated in 1942 by the Secretary of War and the Army Chief of Staff. AER's sole mission is to help soldiers and their dependents. AER is the Army's own emergency financial assistance organization and is dedicated to "Helping the Army Take Care of Its Own". AER provides commanders a valuable asset in accomplishing their basic command responsibility for the morale and welfare of soldiers. AER funds are made available to commanders having AER Sections to provide emergency financial assistance to soldiers - active & retired - and their dependents when there is a valid need. AER funds made available to commanders are not limited and are constrained only by the requirement of valid need. For these reasons, the AER assistance program is conducted within the Army structure by major commanders and their installation/organization commanders through AER sections and other related organizations. Fort Family provides a single gateway to responsive Family Crisis Assistance, available 24/7, 365 days a year. It provides a unit and community based solution to connect people to people. By pinpointing families-in-need and local community resources, the Fort Family Outreach and Support Center can quickly connect the Soldier family and resources thus providing installation-commensurate services in the geographic location of the crisis. Fort Family Outreach and Support Center has established a community based capacity by engaging our Nation's "Sea of Goodwill" to support Soldiers and families closest to where they live. This program assists our local heroes and their families who have suffered a catastrophic event, such as a life-threatening disease, fire, or flood. Realizing money is not the only thing needed during a time of crisis, we meet practical needs as well. Individuals and local business owners help meet those needs at no cost to the family. Our program matches individuals and families with available resources within our community. Helping Heroes Home provides one-time emergency grants to aid veterans making the transition back into civilian life. Since July 2012, thanks to our donors, we've helped more than 3,100 veterans overcome communication challenges and physical, emotional and assimilation hardships with communication services, imperative car repairs, rent payment to avoid eviction and more. Our Forgotten Warriors' Direct Assistance program provides disabled service members, veterans and their families assistance with unexpected expenses. It is not unusual for our troops and veterans to suffer significant loss of income after injury or during separation. For some families, and error in pay or delays in processing claims can have a devastating life changing impact. Our Heroes Journey's assistance program "Adopt a Hero" focuses on our military families and servicemembers who may need help with groceries, gas cards, diapers and other daily necessities. Currently, Our Heroes Journey has adopted nearly 500 Marines and 1200 children from Camp Pendleton Marines Corps base in Oceanside, CA as part of this dynamic program. Emergency financial assistance - STEP’s standard operating procedures focuses on the following eligibility prerequisites: 1) the client is active duty military or a recently (with 18 months) honorable discharged veteran in the pay grade of E1-E6, and 2) the client resides in one of the seven supported counties (San Diego, Orange, Los Angeles, Ventura, San Bernardino, Riverside and Imperial Counties). The American Legion's Family Support Network is ready to provide immediate assistance to service personnel and families whose lives have been directly affected by Operation Iraqi Freedom and America's war on terror. Since Sept. 11, 2001, the nation's active-duty military has been on high alert, and National Guard and reserve units are being mobilized in record numbers. As a result, the families of these men and women often find themselves unable to meet normal monthly expenses, and assistance is needed for a variety of everyday chores. These tasks include grocery shopping, child care, mowing the grass, fixing the family car and other routine household jobs. To address these issues, The American Legion has a nationwide toll-free telephone number, (800) 504-4098 for servicemembers and their family members to call for assistance. Applicants can apply online by clicking the assistance form at the top of the page. Calls are referred to The American Legion department, or state in which the call originated. Departments relay the collected information to a local American Legion post. The local post then contacts the servicemember or family to see how assistance can be provided locally. Since the creation of the Family Support Network during the first Persian Gulf War, thousands of posts have responded to meet these families' needs. The Home Front Cares program provides "one-time" emergency financial assistance for Colorado's military active duty members, veterans, guard and reservists of all branches who have been impacted by service to our nation. The Home Front Cares is a non-profit corporation that has helped approximately 3,300 families, contributing over $4.2 million in aid since our founding in 2003. THFC delivers assistance to the military community in the state of Colorado through a close collaboration with the VA; Vet Centers; Veteran Service Officers; the Army Community Service at Fort Carson; the Family Support Centers at the United States Air Force Academy, Peterson Air Force Base, Cheyenne Mountain Air Force Station, and Schriever Air Force Base. Grants to Families Fund - Assistance for eviction prevention, car payment/insurance/small repairs, and utilities. Energy Assistance Program - As an agency of Energy Outreach Colorado, THFC receives limited grants to pay energy bills for active duty members, reservists, guard members and veterans living in Colorado, who need financial assistance. VeteransPlus is a financial literacy organization devoted to improve the quality of life of those who have worn our nation's uniform, and their families by providing unparalleled solutions that focus on financial security and support in pursuing their economic goals. More than creating financial solutions, we add the unique capability of enabling non-profit partners to demonstrate their commitment and concern for America's veterans through financial education and coaching. The mission of the Yellow Ribbon Registry Network (YRRN) is to provide military Heroes a starting place to seek assistance and eliminate the "search" for those who can help. With relentless pursuit, the YRRN will continue to evolve in order to meet that goal. Additionally, the YRRN will partner with organizations who have established themselves as - difference makers - in the lives of our nations Heroes and their families. Furthermore, the YRRN will engage American Patriots (donors) who share a passion to assist those who have worn our nations uniform and connect them through a national network. MOM4USA's mission is to shine a light on the unique lifestyle of the military family and connect with partners in the community to show our appreciation. We strive to create opportunities for giving, community service and to tell the story of hundreds of unique families. Our programs provide young military families with gifts of gratitude from the community that will express thanks and help improve their quality of life. These programs serve more than 50,000 active-duty military and their dependents each year with innovative programs that provide essential items. Housing assistance - helping to prevent foreclosures and evictions. The VFW National Home for Children serves as a living memorial to America’s veterans by helping our nation’s military and veteran families during difficult times. It was founded in 1925 as a place where the families left behind by war -- mothers and children, brothers and sisters -- could remain together, keeping the family circle intact even when their serviceman didn't come home. School time! It’s an exciting time for the kids, but can be a time of frustration and worry for parents – especially military families. A military salary simply doesn't go as far as it needs to sometimes. Imagine having moved to a new duty station, trying to settle in right before or even in the middle of the school year. Among all the other things you are trying to stretch your money to cover, you find out the new school requires uniforms. Of course, there's then the extra expense for supplies, backpacks, athletics, and other school programs. Operation Back to School helps with the school related expenses. We work with military and charity organizations to find veterans in need of a vehicle and with our network of auto-body shops and national salvage companies to identify and refurbish vehicles for donation. We also work closely with various organizations to administer this program every year.